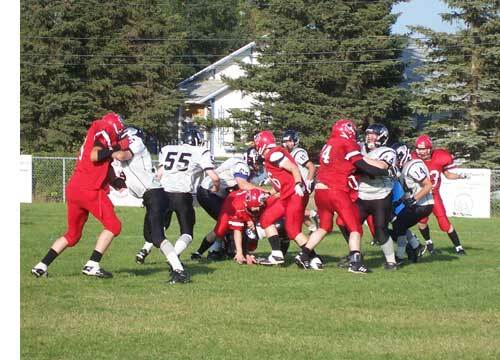 Nine man football in Saskatchewan is in four conferences with Tisdale Tornados in conference #1 with Foam Lake, Humboldt, Melfort, Nipawin and Wynyard. 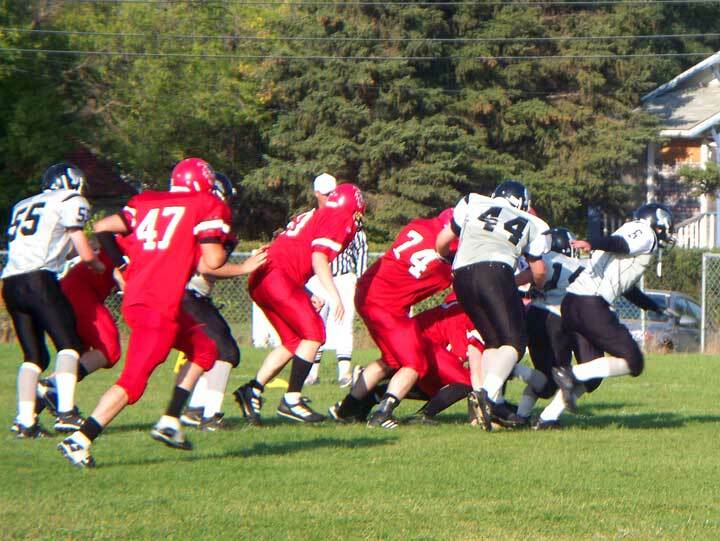 Esterhazy Warriors are in Conference #3 with Canora, Fort Qu'Appelle, Melville, Swan River and Yorkton Sacred Heart. 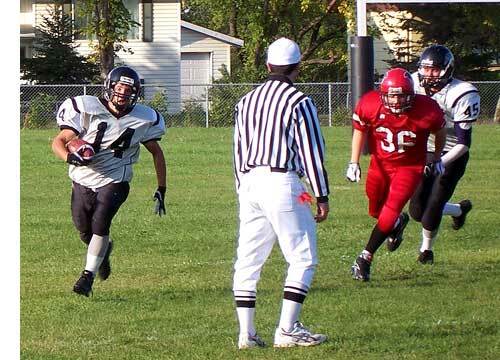 In all of these and the other communities in conferences #2 and #4 football is a big deal with the teams starting preparation for the coming season long before school closes for summer in June. Esterhazy's first day of school is tomorrow, Tuesday, September 1. 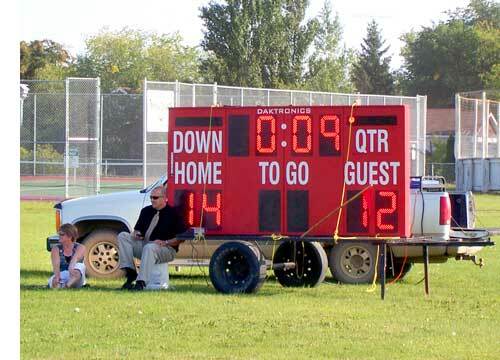 The score clock shows the situation seconds before half time when Esterhazy shaved the Tornados lead down to two points with a touch down late in the second quarter. After all this is the first game of the year for these two teams and there were a lot of ball handling problems (above and right) but both teams showed outstanding discipline and with Friday's exhibition game in Nipawin on Friday of this week the Tornados will be ready for this season wih a roster of talented players and what clear in their game today, a good level of determination and willingness to excel. 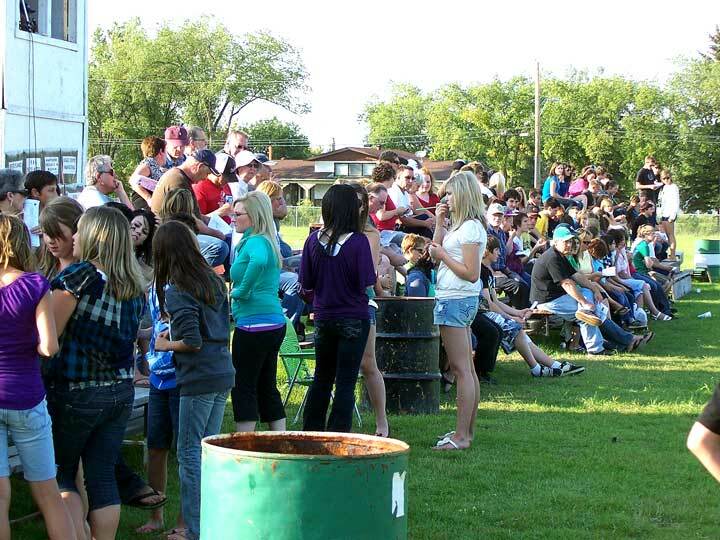 The picture above shows the crowd out for an exhibition game on a beautiful late summer day. This was a minute before the start of the third quarter. 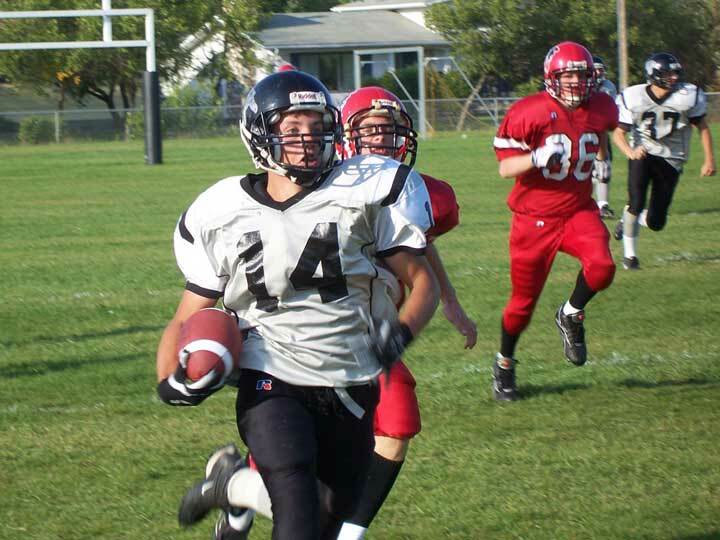 Esterhazy kicked off to the Tornados and the ball was caught by Evan Pelchat who got one block then it was beep beep and down the field he came (right and top of page) making the score 20 to 12. 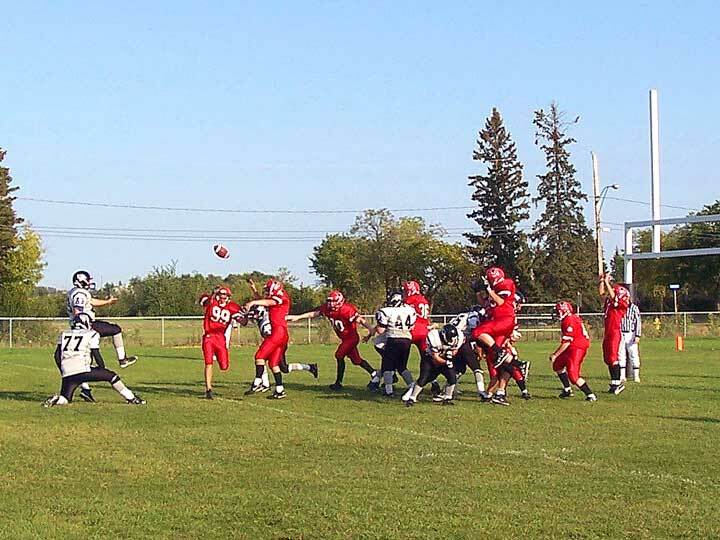 Both teams had trouble with conversions (below) as the Warriors blocked this one. Fans had an outstanding program to guide them through today's game and the businesses of Tisdale, as usual got right in step with sponsoring the Tornados. Exhibition game on Friday, September 4 in Nipawin, first home game Friday September 11 with Nipawin, September 18th the Tornados play in Wynyard, September 28 they play in Foam Lake, on October 2nd Humboldt plays here the following week, October 9th, the Tornados are home with Melfort and the regular season wraps up as it started with Tisdale playing on October 16th in Nipawin.